In an instant the blue-sky, 70-degree, high-country afternoon morphed into a mother of a storm. My husband and I jumped off our horses and secured them, threw our saddles adorned with all our gear into a pile, ripped the tent fly from its pouch, jumped atop the saddles and covered the human-plus-gear mound with the waterproof cover. Clouds generated wind, which delivered rain, which begot hail. We weathered the storm, which lasted into twilight, without getting drenched or frozen. Take your time when selecting a primitive or wilderness campsite so you can stay dry, safe, and well rested. Whether in the wilds miles from civilization or at a primitive campground, numerous campsite selection criteria should be considered. Having the right camping gear is also important. Contact the land-management agency for the area where you plan to camp to check on camping regulations or permit requirements. Ask about availability of established campsites or check an area map for symbols that indicate established campsites. Plan on the possibility of having to split up tent site location if traveling with a group. Many areas are unable to accommodate groups of tents. 1. Seek a level site if you want to sleep well. If a slight slope is present, pitch the tent so you can sleep with your head above your feet or vice versa – whichever makes you most comfortable. Sleeping in a lateral position causes muscles to fight the terrain all night and an aching body in the morning. 2. Consider the terrain. Bumpy, clumpy meadows, although seemingly soft, are usually less comfortable than a flat pine-straw bed – even with a camping sleep pad like the Therm-A-Rest Trail Scout pad. Meadow locations with vegetation also are easily harmed by tents and/or sleeping bags. 3. Identify overhead dangers. Dead trees/limbs or the potential for falling rocks create dangerous situations. Without the protection of a tent, even large pine cones pack a wallop. 4. Avoid insects naturally. Mosquitoes, ticks and other insects inhabit moist, protected areas. Select a site where a breeze is prevalent. Moving air deters insects. 5. Avoid flat areas in depressions where water gathers. Select a spot that naturally funnels water away from the sleeping area. Although some improved, public camping areas allow digging a shallow trench around the tent to disburse water, avoid the practice through thoughtful selection. 6. Seek protected areas when strong winds blow or are forecasted. Rock outcroppings or thick brush can provide cover. 7. Avoid extreme weather dangers. Dried-up creek beds, high ridges or deep basins are danger magnets. Extreme weather, flooding rains, high winds, lightening and cold that settles in bottoms can pose uncomfortable circumstances at best and life-threatening challenges at worst. 8. Set up based on worst-case scenarios. Stake the tent, put on the tent fly and stow critical gear inside the tent. Doing so allows you to enjoy your wilderness home rather than find yourself hectically pounding stakes or gathering gear in an unexpected rainstorm at 4 a.m.
9. Avoid setting up close to other campers for privacy, quiet and wilderness enjoyment. Wilderness camping is sometimes referred to as, Free Camping, Backcountry Camping, Primitive Camping or Boondocking. Laurie Lee Dovey, who is the Executive director/CEO of the Professional Outdoor Media Association (POMA), is a highly awarded writer and photographer, marketing and media consultant, and speaker. 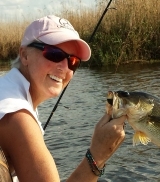 An avid angler, hunter, sport shooter, and on and off full-time RVer, Dovey has been writing about the traditional outdoor sports for more than 30 years. Her adventures take into the wilds an on the waters of both North and South America, but she's primarily hooked on the U.S. and Canada — where her 1971 Silver Eagle bus, which has been converted to a luxury motorhome, can easily travel. What Makes A Good Camping Knife?